J Unexplored Med Data 2019;4:2.10.20517/2572-8180.2019.07© The Author(s) 2019. 1Department of Surgery, Duke University Medical Center, Durham, NC 27710, USA. 2Duke Cancer Institute, Duke University Medical Center, Durham, NC 27710, USA. 3Department of Biostatistics, Duke University, NC 27710, USA. The incidence of ductal carcinoma in situ (DCIS) is increasing in the United States and by 2020 there are projected to be 33,000 new cases of DCIS in women over the age of 65. Among all women with DCIS, the 20-year risk of breast-cancer related mortality is 3.3%, and older women have been shown to have lower rates of local recurrence than younger women[4,5]. Although breast cancer is common among older women, heart disease is the number one cause of death in the United States for all women over 65, while breast cancer is the fifth leading cause of death in women ages 65-74 and tenth leading cause of death in women over 75. Therefore, the option of “doing less” becomes particularly salient among elderly patients with pre-invasive breast cancer (DCIS) for which the prognosis is generally excellent, incidence has increased, and other factors may have a stronger association with overall prognosis. Within the field of breast oncology, there is an ongoing effort to reduce the administration of tests and treatments, and accompanying side effects that are unlikely to provide a meaningful benefit. This is particularly true for the elderly breast cancer population. For women with early or low-risk breast cancer, several studies have examined whether we can safely treat these patients by “doing less” without compromising overall survival (OS). Hughes et al. [7,8] demonstrated that in women over 70 with estrogen-receptor positive (ER+) invasive breast cancer, radiation provided no additional benefit in OS. Another study of women over 60 concluded that within a subset of elderly patients with DCIS, lumpectomy alone may be a viable option. Furthermore, the “Choosing Wisely” guidelines from the Society of Surgical Oncology recommend against routine sentinel lymph node biopsy in women over 70 with clinically node negative, ER+ breast cancer, as studies have suggested that it does not improve survival. Based on current national guidelines, maximal local-regional therapy is the current standard of care for DCIS. Among elderly patients, however, in light of competing comorbidities and a presumed limited life expectancy, the treatment of DCIS remains more controversial. As such, we aimed to evaluate outcomes in an elderly (age ≥ 70 years) patient population, in order to determine the optimal treatment plan, as well as to identify patient and/or tumor characteristics that may help predict who may benefit from less extensive treatment strategies. The National Cancer Database (NCDB) was used to select all women ages ≥ 70 years diagnosed with non-invasive (pTis or pT0, pN0, cM0 or pM0) breast cancer from 2004-2015 who underwent surgery of the primary breast tumor (lumpectomy or mastectomy). Patients with missing or unknown pathological staging, missing ER or progesterone receptor (PR) status, unknown surgery or surgery other than lumpectomy or mastectomy, missing radiation treatment data after lumpectomy, histologies other than those listed in the World Health Organization classification table, or missing survival data (including all patients diagnosed in 2015) were excluded. Patients with lobular carcinoma in situ were specifically excluded. Patients who received any neoadjuvant therapy (systemic, endocrine, and/or radiation) were also excluded, as this may have changed their pathological staging. Patients were stratified into local-regional treatment groups as follows: (1) lumpectomy alone (no radiation), (2) lumpectomy + radiation, or (3) mastectomy. Patients undergoing mastectomy or lumpectomy + radiation were analyzed together, given likely similar outcomes following both procedures. Patient characteristics were summarized by n (%) for categorical variables, and median (interquartile range, IQR) for continuous variables, for all patients and by age group. T-tests and chi-square tests were used to test for differences between groups for continuous and categorical variables, respectively. Select subgroup analyses were conducted for presumably low risk patients as follows: (1) those with grade 1 disease, (2) those with ER+ disease, and (3) those with low-volume disease (extent < 3 cm). For the ER+ subgroup analysis, treatment groups were further subdivided as follows: (1) lumpectomy alone (no radiation, no endocrine therapy); (2) lumpectomy + endocrine therapy (no radiation); (3) lumpectomy + radiation (no endocrine therapy), or mastectomy (no endocrine therapy); or (4) lumpectomy + radiation + endocrine therapy, or mastectomy + endocrine therapy. OS was defined as the time from diagnosis to death or last follow-up. Kaplan-Meier curves were used to visualize the unadjusted OS; 5-year and 10-year survival rates, and 95% confidence intervals (CI) were reported. A Cox proportional hazards model was used to estimate the effect of the local-regional treatment (lumpectomy + radiation or mastectomy vs. lumpectomy alone) on OS, after adjustment for known covariates; hazard ratios (HR) and 95% CIs were reported. All survival models included a robust sandwich covariance estimator to account for patients treated at the same facility. Only patients with available data for all covariates were included in each model, and effective sample sizes are reported for each table/figure. Of note, disease extent (“tumor size”) was missing for 30% of patients, and as such, analyses were performed with and without this variable. No adjustments were made for multiple comparisons, and a P-value < 0.05 was considered statistically significant. All statistical analyses were conducted using SAS, version 9.4 (SAS Institute, Cary NC). 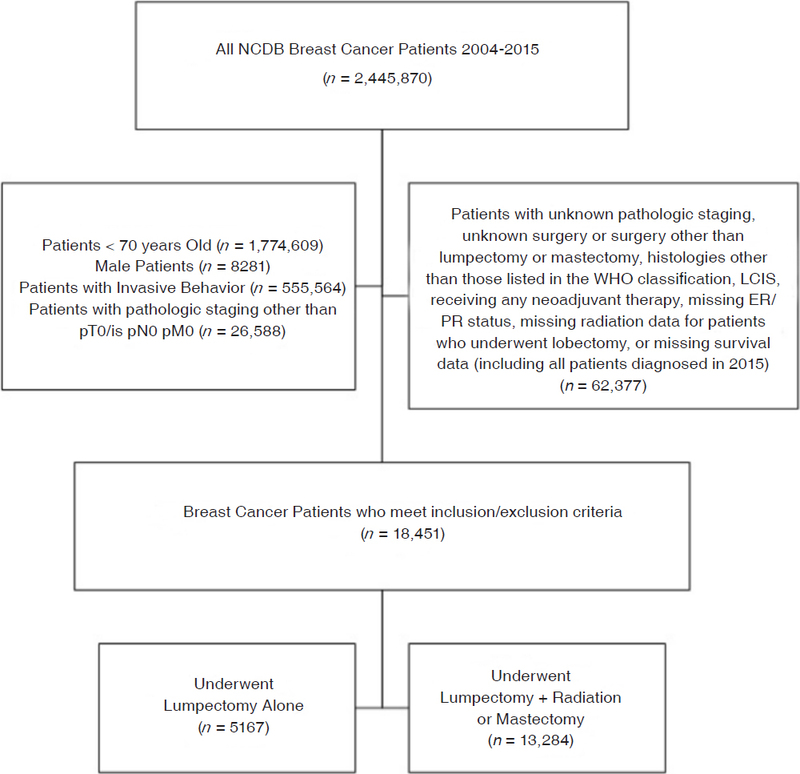 Of the 18,451 patients who met the inclusion criteria [Figure 1], 5,167 underwent lumpectomy alone, and 13,284 underwent lumpectomy + radiation or mastectomy. The median age was 75 years (IQR 72-79 years), and 80.6% of patients had a Charlson/Deyo comorbidity score of 0. Tumors were generally small (median = 1 cm) and hormone receptor positive (HR+: 82% ER+, 71.6% PR+) [Table 1]. The median follow-up was 64.4 months (95%CI: 63.6-65.2). Patients undergoing lumpectomy alone (vs. lumpectomy+radiation or mastectomy) were more likely to have grade 1 tumors (23% vs. 13.9%, P < 0.001) and to be HR+ (ER+: 88.3% vs. 79.6%, P < 0.001; PR+: 78.7% vs. 68.6%, P < 0.001). Among HR+ patients, 32.2% received endocrine therapy overall, which was less common among those who underwent lumpectomy alone (25.9% vs. 34.9%, P < 0.001) [Table 1]. The unadjusted median OS was higher for patients who underwent lumpectomy+radiation or mastectomy compared to those who underwent lumpectomy alone (135.4 months vs. 112.7 months, log-rank P < 0.001) [Figure 2A]. Notably, the unadjusted 10-year OS was only 54% for the entire cohort of elderly DCIS patients, regardless of treatment [Figure 2A]. The differences in OS were notably smaller when further stratified by age, particularly those ages 70-74 years and 75-79 years [Figure 2B and C]. After adjustment, patients who underwent lumpectomy+radiation or mastectomy had an improved OS compared to lumpectomy alone (HR = 0.841, 95%CI: 0.774-0.914, P < 0.001). Other tumor and treatment factors associated with OS included PR status (P = 0.005) and receipt of endocrine therapy (P < 0.001); however, tumor grade and ER status were not (both P > 0.05) [Table 2]. Given that 30% of patients were missing data for tumor size, analyses were conducted with and without this variable. When included in the adjusted model, tumor size was not significantly associated with OS (P = 0.38) [Supplementary Table 1], and thus, results excluding this variable (to allow for a larger cohort) are reported. For patients with grade 1 disease (n = 2,602), lumpectomy+radiation or mastectomy was not associated with an improved OS compared to those undergoing lumpectomy alone (HR = 0.875, 95%CI: 0.74-1.036, P = 0.12). In addition, ER/PR status and endocrine therapy were also not associated with OS (all P > 0.05) [Table 3]. Subgroup analysis of grade 1 tumors including tumor size as a variable were fairly similar, and tumor size was again not associated with OS (P = 0.49) [Supplementary Table 2]. For patients with ER+ disease, treatment with (lumpectomy + radiation or mastectomy) + endocrine therapy had the most significant improvement in OS compared to lumpectomy alone (without radiation or endocrine therapy) (HR = 0.669, 95%CI: 0.598-0.748, P < 0.001). Lumpectomy + endocrine therapy (no radiation) was associated with an improved OS compared to lumpectomy alone, although to a lesser degree (HR: 0.823, 95%CI: 0.704-0.962, P = 0.02), as was (lumpectomy + radiation or mastectomy) without endocrine therapy (HR 0.855, 95%CI: 0.782-0.935, P < 0.001) [Table 4]. Results were similar when tumor size was included in the analysis, although tumor size was not significantly associated with OS (P = 0.74) [Supplementary Table 3]. Among patients with low volume disease (defined as size < 3 cm) (n = 7901), receiving lumpectomy + radiation or mastectomy was associated with an improved OS (vs. lumpectomy alone; HR: 0.812, 95%CI: 0.725-0.91, P < 0.001). PR+ status (vs. PR-) and endocrine therapy receipt (vs. not received) were also associated with an improved survival (both P < 0.05), while tumor grade and ER status were not (both P > 0.05) [Table 5]. Treatment of DCIS in the elderly presents a unique challenge, both due to the heterogeneity of the disease and of the patient population in terms of overall health, life expectancy, and competing comorbidities. Clinicians and researchers are questioning whether older women with DCIS receive the same benefit from the standard treatments offered to younger women. Furthermore, by 2030 it is estimated that 21% of the United States population will be over the age of 65 (approximately 74 million people), and thus the importance of personalizing treatment plans is becoming more relevant than ever. Our data suggest that chronologic age alone may not be sufficient for determining the ideal local-regional treatment strategy. Although standard therapy may be associated with a statistically significant improvement in OS for otherwise healthy elderly women with DCIS with a longer life expectancy, there is likely a strong selection bias in this population and study. In addition, the clinical benefit of a potential 10%-20% improvement remains less clear in this age group after also factoring in the risks and inconvenience of more intensive and lengthier treatment strategies and patient preferences/limitations. When evaluating treatment options for low risk disease in particular, it is important to consider the overall context in which this disease is occurring. For women that are currently 70 years old, the average expectation of remaining life is 16.7 years, and this decreases to 9.8 years for women that are currently 80 years old. This is especially relevant when discussing DCIS, as the 5-year disease specific survival has been shown to be > 99%, and the 20-year breast cancer specific mortality has been shown to be 3.3%. Furthermore, for select women over 70 with DCIS, the probability of dying from breast cancer is likely 0.01 in the next 5 years, and 0.05 over the next 27.9 years, whereas their risk of dying from another cause may be 0.16 at 5 years and 0.94 at 27.9 years, thus underscoring the fact that women are more likely to die of causes other than their DCIS. In our overall cohort of elderly women with DCIS, the unadjusted 10-year OS was only 54% [Figure 2A], which decreased to 29.4%-34.3% in women ≥ 80 years [Figure 2D], suggesting that many women may not live long enough to experience a recurrence and/or a shortened lifespan from that recurrence. Furthermore, the 10-year OS was 48% for the entire lumpectomy alone group, which translates to an absolute 9% (unadjusted) improvement in 10-year OS (57%) for those receiving more aggressive local-regional treatment [Figure 2A]. Given the already low OS numbers and extremely low risk of recurrence, it may be difficult to make strong recommendations for the addition of radiation therapy, which has generally been shown to improve recurrence rates more than OS, particularly in the elderly[8,9]. Others have suggested that radiation therapy can be safely omitted in elderly women with breast cancer without compromising survival. Ho et al. retrospectively evaluated 646 women ≥ 60 years with DCIS undergoing wide local excision (WLE), WLE + radiation, or mastectomy, stratified by age. In this study, older age was associated with less aggressive treatment, but the local recurrence rates did not significantly differ by age. Similar to our findings, this study also suggests that less aggressive treatment is likely adequate in this population. In invasive cancer, the Cancer and Leukemia Group B (CALGB) 9343 trial randomized 636 women over the age of 70 with clinical stage I, ER+ breast cancer who underwent lumpectomy to either tamoxifen alone or tamoxifen + radiation. At 10 years follow-up, the radiation group had a notable improvement in local-regional recurrence, but there was no significant difference in OS. Of note, this trial enrolled stage I invasive breast cancer rather than DCIS, their patient cohort included only ER+ patients, and all patients reportedly received tamoxifen for 5 years. Comparably, we demonstrated that among elderly ER+ DCIS women, lumpectomy + endocrine therapy was associated with a similar OS to lumpectomy + radiation or mastectomy (without endocrine therapy) [Table 4], again suggesting that omitting radiation may be an acceptable treatment strategy. Interestingly, our data suggest that a higher proportion of lumpectomy alone patients had grade 1 disease compared to those who underwent more intensive local-regional treatment [Table 1]. In this grade 1 subgroup, OS was not associated with the local-regional treatment group, suggesting that providers may already be selecting some patients for radiation omission. However, it is also important to note that only age and the comorbidity score were associated with survival in this subgroup analysis, suggesting that tumor and/or treatment factors are of limited relevance when selecting a treatment strategy for elderly women with grade 1 DCIS. Furthermore, tumor grade was not associated with survival in the overall cohort [Table 2], suggesting that this variable alone may not be sufficient for selecting the appropriate treatment strategy. Similarly, a higher proportion of elderly women undergoing lumpectomy alone had HR+ disease (compared to lumpectomy + radiation or mastectomy). Although survival in this subgroup (ER+ disease) appeared to improve with each additional treatment, it is important to recognize that only 32.2% of the entire cohort received endocrine therapy [Table 1]. This data may suggest that healthier women were more likely to opt for more aggressive treatments (selection bias), although they were more likely to have a better outcome regardless of their treatments. Notably, there appeared to be a strong degree of selection bias in our study towards an overall healthier population. DCIS as a diagnosis likely reflects overall good health, and this is suggested by the high proportion of patients with a Charlson/Deyo comorbidity score of 0 (80.5%). In a recent study of select breast, colorectal, and lung cancer patients in NCDB, the proportion of patients with a Charlson/Deyo comorbidity score ≥ 2 was lowest for the breast cancer population (2.8% compared to 8.3% of colorectal cancer patients and 13.2% of lung cancer patients). These healthy elderly women are more likely to undergo routine screening mammograms, and thus are more likely to be diagnosed with DCIS. Several prior studies have confirmed the increased incidence of DCIS following widespread adoption of screening mammography[16,17]. Prior studies have also demonstrated a median prevalence of DCIS of 8.9% at the time of autopsy in women not previously diagnosed with breast cancer, further supporting that increased screening will uncover more asymptomatic DCIS. The Charlson/Deyo comorbidity score was originally developed to predict 1-year mortality for patients admitted to the hospital[19,20], and its accuracy varies widely based on the population being studied[15,21]. Furthermore, it has been shown to underestimate comorbidity (for possibly > 19% of breast cancer patients in NCDB), and a number of risk scores have been shown to perform better than the Charlson/Deyo comorbidity score. Regardless, it is the only risk score available in the NCDB data set, and it has been shown to likely be sufficient for risk adjustment for survival outcomes among surgical patients. In our analysis, the comorbidity score was one of the only variables that was consistently associated with survival in all subgroup analyses (comorbidity score = 1: HR range 1.483-1.57; comorbidity score ≥ 2: HR range 2.076-2.48), supporting that an elderly woman’s overall health status and comorbidities are likely more important than her DCIS diagnosis, as related to her overall prognosis. Although prognostic tools may help clinicians estimate life expectancy in the setting of a patient’s other comorbidities, this task may be daunting for some providers. As such, the International Society of Geriatric Oncology and European Society of Breast Cancer Specialists recommend that the care of elderly breast cancer patients include a comprehensive geriatric assessment, which may help oncologists evaluate functional status and comorbidities in this heterogeneous population. However, factors other than recurrence and prognosis are also important to consider when weighing treatment options. In a recent study by Tang et al. evaluating functional status and survival after breast cancer surgery in nursing home residents, the 1-year mortality rates were 29%-41%. Among 1-year survivors, significant functional decline occurred across all groups. These findings suggest that for medically complex and functionally compromised patients, significant morbidity and mortality is common during the peri-operative period and onward, which may or may not be related to the surgery itself. As such, one must question the benefit and/or utility of even “low risk” surgeries in this population. Beyond surgery, radiation may be associated with pain, fatigue, skin fibrosis, and/or skin discoloration, in addition to being costly and time consuming. Tamoxifen also has potential toxicity, including vasomotor symptoms, osteoporosis, and thrombotic events, and these risks should be equally considered when making treatment recommendations. Considering these potential adverse side effects, patient preference and risk tolerance/aversion are essential components of the treatment discussion. By exploring patient preferences, clinicians should engage patients in a shared decision-making process. Thus, especially for a healthy population of older women with DCIS, it is important to discuss all treatment options, including “doing less”. There were several limitations to our study that merit acknowledgement, including those inherent in any large, retrospective data set. Specifically, 30% of patients in our cohort were missing tumor size. Furthermore, radiation data may have been incompletely captured, and compliance with endocrine therapy is not comprehensively reported in the NCDB. Comorbidity scores have been shown to be underestimated in the NCDB, partly because missing data is coded as a score = 0. Additionally, the NCDB provides OS data, but not cancer-specific survival. This may limit the conclusions that can be drawn as to efficacy of treatments, although from an elderly patient’s perspective, OS may be a more meaningful endpoint. As previously discussed, there appears to be a strong degree of selection bias in our study, and healthier patients receiving more treatment were therefore more likely to live longer regardless of treatment. While this may limit the generalizability of our study, it may also indicate that physicians are utilizing a personalized approach to maximize benefits while minimizing potential risks. In conclusion, our data demonstrate that chronologic age alone should not preclude a patient from receiving standard therapy for DCIS. However, in this population, patient fitness, competing comorbidities, and patient preferences are even more critical factors to consider in light of potentially limited benefits of treatment to overall survival and quality of life. In favorable cancer diagnoses such as DCIS, thoughtful omission of standard therapy may be considered and should be guided by patient values through shared decisions and a multidisciplinary evaluation with a geriatric team. Given the limitations of our study, ongoing prospective research[27-29] evaluating the biology and natural history of DCIS will be essential in determining the appropriate treatment strategy for all age groups and health status. Our data source was the National Cancer Database (NCDB), 2015 PUF. This project and its authors are all supported by the Duke Cancer Institute through NIH grant P30CA014236 (PI: Kastan). All authors declared that there are no conflicts of interest related to this work. 1. Virnig BA, Wang SY, Shamilyan T, Kane RL, Tuttle TM. Ductal carcinoma in situ: risk factors and impact of screening. J Natl Cancer Inst Monogr 2010;2010:113-6. 2. Smith BD, Smith GL, Hurria A, Hortobagyi GN, Buchholz TA. Future of cancer incidence in the United States: burdens upon an aging, changing nation. J Clin Oncol 2009;27:2758-65. 3. Narod SA, Iqbal J, Giannakeas V, Sopik V, Sun P. Breast cancer mortality after a diagnosis of ductal carcinoma in situ. JAMA Oncol 2015;1:888-96. 4. Veronesi U, Luini A, Del Vecchio M, Greco M, Galimberti V, et al. Radiotherapy after breast-preserving surgery in women with localized cancer of the breast. N Engl J Med 1993;328:1587-91. 5. Worni M, Akushevich I, Greenup R, Sarma D, Ryser MD, et al. Trends in treatment patterns and outcomes for ductal carcinoma in situ. J Natl Cancer Inst 2015;107:djv263. 6. USA Life Expectancy. USA Causes of death by age and gender. Available from: https://www.worldlifeexpectancy.com/usa-cause-of-death-by-age-and-gender. [Last accessed on 20 Mar 2019]. 7. Hughes KS, Schnaper LA, Berry D, Cirrincione C, McCormick B, et al. Lumpectomy plus tamoxifen with or without irradiation in women 70 years of age or older with early breast cancer. N Engl J Med 2004;351:971-7. 8. Hughes KS, Schnaper LA, Bellon JR, Cirrincione CT, Berry DA, et al. 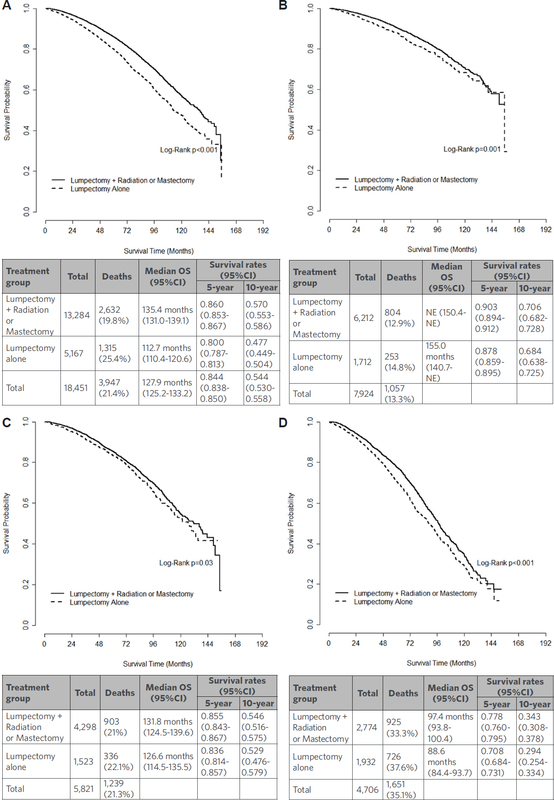 Lumpectomy plus tamoxifen with or without irradiation in women age 70 years or older with early breast cancer: long-term follow-up of CALGB 9343. J Clin Oncol 2013;31:2382-7. 9. Ho A, Goenka A, Ishill N, Van Zee K, McLane A, et al. The effect of age in the outcome and treatment of older women with ductal carcinoma in situ. Breast 2011;20:71-7. 10. Martelli G, Miceli R, Daidone MG, Vetrella G, Cerrotta AM, et al. Axillary dissection versus no axillary dissection in elderly patients with breast cancer and no palpable axillary nodes: results after 15 years of follow-up. Ann Surg Oncol 2011;18:125-33. 11. Gradishar WJ, Anderson BO, Aft R, Balassanian R, Blair SL, et al. NCCN guidelines: breast cancer, version 1.2018. National Comprehensive Cancer Network, Inc.; 2018. 12. Older Americans 2016: Key Indicators of Well-Being. Federal Interagency Forum on Aging-Related Statistics. Washington, DC: U.S. Government Printing Office; 2016. 13. Arias E, Heron M, Xu JQ. United States life tables, 2014. National Vital Statistics Reports. Hyattsville, MD: Center for Disease Control; 2017. 14. Schairer C, Mink PJ, Carroll L, Devesa SS. Probabilities of death from breast cancer and other causes among female breast cancer patients. J Natl Cancer Inst 2004;96:1311-21. 15. Wong ML, McMurry TL, Schumacher JR, Hu CY, Stukenborg GJ, et al. Comorbidity assessment in the national cancer database for patients with surgically resected breast, colorectal, or lung cancer (AFT-01, -02, -03). J Oncol Pract 2018;14:e631-43. 16. Virnig BA, Tuttle TM, Shamliyan T, Kane RL. Ductal carcinoma in situ of the breast: a systematic review of incidence, treatment, and outcomes. J Natl Cancer Inst 2010;102:170-8. 17. Bleyer A, Welch HG. Effect of three decades of screening mammography on breast-cancer incidence. N Engl J Med 2012;367:1998-2005. 18. Welch HG, Black WC. Using autopsy series to estimate the disease “reservoir” for ductal carcinoma in situ of the breast: how much more breast cancer can we find? Ann Intern Med 1997;127:1023-8. 19. Charlson ME, Pompei P, Ales KL, MacKenzie CR. A new method of classifying prognostic comorbidity in longitudinal studies: development and validation. J Chronic Dis 1987;40:373-83. 20. Deyo RA, Cherkin DC, Ciol MA. Adapting a clinical comorbidity index for use with ICD-9-CM administrative databases. J Clin Epidemiol 1992;45:613-9. 21. Yurkovich M, Avina-Zubieta JA, Thomas J, Gorenchtein M, Lacaille D. A systematic review identifies valid comorbidity indices derived from administrative health data. J Clin Epidemiol 2015;68:3-14. 22. Yourman LC, Lee SJ, Schonberg MA, Widera EW, Smith AK. Prognostic indices for older adults: a systematic review. JAMA 2012;307:182-92. 23. Biganzoli L, Wildiers H, Oakman C, Marotti L, Loibl S, et al. Management of elderly patients with breast cancer: updated recommendations of the international society of geriatric oncology (SIOG) and european society of breast cancer specialists (EUSOMA). Lancet Oncol 2012;13:e148-60. 24. Tang V, Zhao S, Boscardin J, Sudore R, Covinsky K, et al. Functional status and survival after breast cancer surgery in nursing home residents. JAMA Surg 2018; doi: 10.1001/jamasurg.2018.2736. 25. Amir E, Seruga B, Niraula S, Carlsson L, Ocana A. Toxicity of adjuvant endocrine therapy in postmenopausal breast cancer patients: a systematic review and meta-analysis. J Natl Cancer Inst 2011;103:1299-309. 26. Mallin K, Palis BE, Watroba N, Stewart AK, Walczak D, et al. Completeness of American cancer registry treatment data: implications for quality of care research. J Am Coll Surg 2013;216:428-37. 27. Francis A, Fallowfield L, Rea D. The LORIS trial: addressing overtreatment of ductal carcinoma in situ. Clin Oncol (R Coll Radiol) 2015;27:6-8. 28. Elshof LE, Tryfonidis K, Slaets L, van Leeuwen-Stok AE, Skinner VP, et al. Feasibility of a prospective, randomised, open-label, international multicentre, phase III, non-inferiority trial to assess the safety of active surveillance for low risk ductal carcinoma in situ - The LORD study. Eur J Cancer 2015;51:1497-510. 29. Lynch T, Frank ES, Collyar DE, Basila D, Pinto D, et al. Comparison of operative to monitoring and endocrine therapy for low-risk DCIS (COMET study). J Clin Oncol 2018;36:TPS599.